Four persons were arrested and five others detained on the charges of instigating and participating in mob violence at Syana in Bulandshahr, Uttar Pradesh. Of the around 70 persons booked in the FIR based on the complaint of sub-inspector Subash Chandra, 26 have been named. The charges include murder, attempt to murder, rioting, sedition, damage to public property and dacoity. A separate FIR was also filed against seven Muslim residents of Naya Bans village on charges of cow slaughter, based on the complaint of Yogesh Raj. Yogesh Raj and others have been accused of leading the mob and “instigating them” despite assurances by the police that an FIR would be filed in the cow slaughter case, the FIR said. The National Human Rights Commission has issued notice to the State government and the DGP over the incident. The government and the Prime Minister are bound by the Constitution, which does not permit an ordinance to build a Ram temple in Ayodhya, Union Minister and NDA ally Ramvilas Paswan said. His Lok Janshakti Party, Mr. Paswan said, had always held that everyone should wait for the verdict of the Supreme Court, which is looking at the issue from all perspectives. The Supreme Court permitted the Income Tax Department to reopen a 2011-12 tax assessment case against Congress president Rahul Gandhi and former party chief Sonia Gandhi in connection with the National Herald case. A Bench headed by Justice A.K. Sikri said it would be open to the Assessing Officer of the I-T Department to complete the assessment and pass the assessment order as well, but it would not be given effect to till further orders of the court. 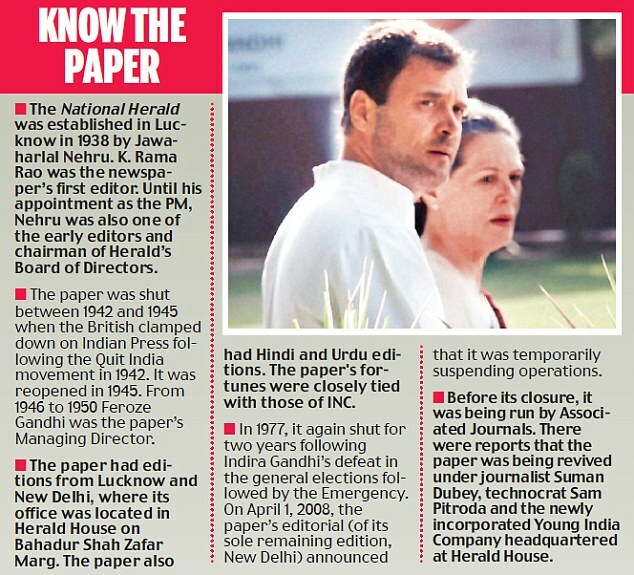 The acquisition of Associated Journals Ltd — publisher of the National Herald newspaper — by Young Indian, a company in which the Congress president and Ms. Sonia Gandhi are majority stakeholders, is at the heart of the case. British national Christian James Michel, wanted in the alleged Rs. 3,700 crore AgustaWestland helicopter deal bribery case, was extradited to India from the United Arab Emirates (UAE). Michel was brought to Delhi on an Aviation Research Centre plane of the Research & Analysis Wing (R&AW) and escorted to the Central Bureau of Investigation headquarters by a team of Delhi police officials. He is likely to be produced before a city court. Under the guidance of National Security Adviser Ajit Doval, the entire operation was coordinated by CBI Director in-charge M. Nageswara Rao. Michel was arrested by the Dubai police in February 2017 on the basis of an Interpol Red Notice issued against him. Michel’s role in the purchase of 12 helicopters surfaced in 2012 as a middleman for swinging the deal in favour of AgustaWestland and making illegal payments to Indian public servants. Initially, the investigation conducted by Italian authorities indicted him for offences of international bribery, the agency said. The CBI filed a charge sheet against the accused in September 2017. Among those arraigned were retired Air Chief Marshal S.P. Tyagi, his cousins, former Air Marshal J.S. 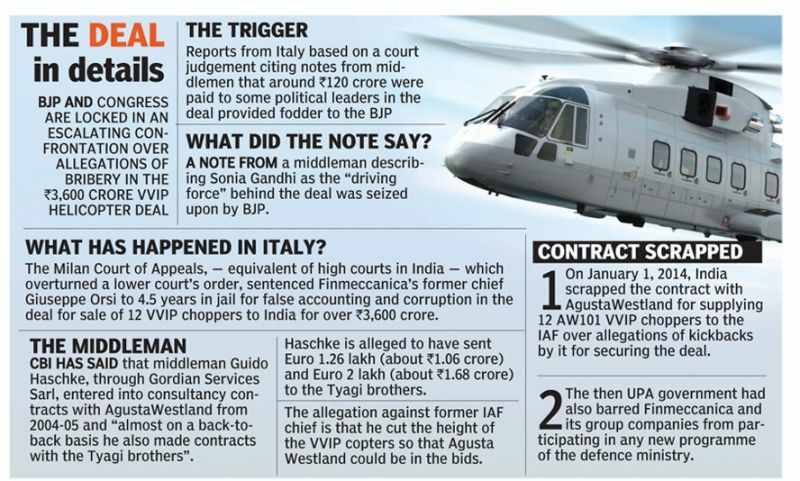 Gujral, two other alleged middlemen Carlo Gerosa and Guido Haschke, the then AgustaWestland CEO Bruno Spagnolini, Finmeccanica chairman Giuseppe Orsi and others. The agency alleged a loss of about Rs. 2,666 crore to the exchequer due to the scam. The Enforcement Directorate also charged Mr. Michel and several others under the Prevention of Money Laundering Act. The agency alleges that Mr. Michel entered into criminal conspiracy with co-accused persons and got the service ceiling of VVIP helicopters reduced from 6,000 to 4,500 metres to ensure that the company could bid for the deal. The contract for 556.262 million euros was awarded to AgustaWestland International Limited (UK) on February 2, 2010. 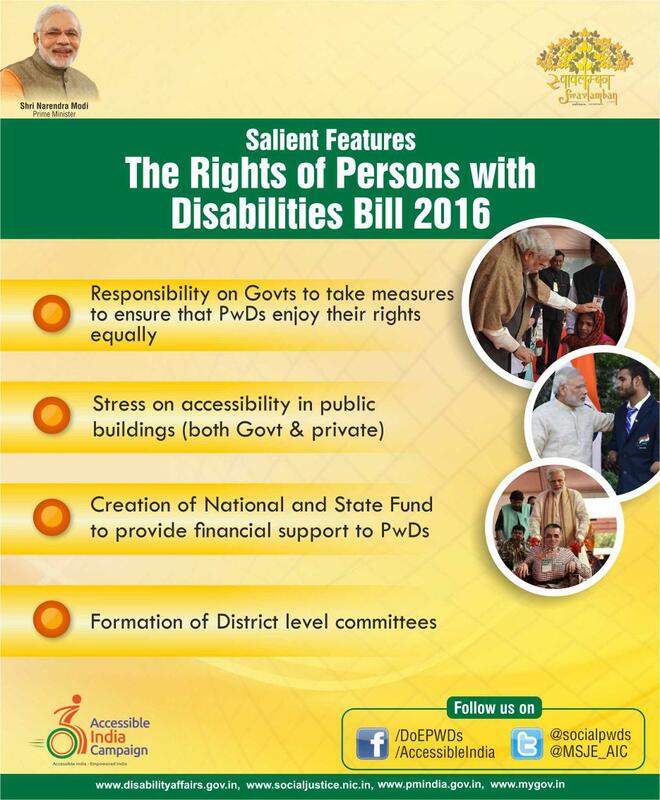 A study conducted by the Disability Rights India Foundation (DRIF) on the implementation of the Rights of Persons with Disabilities (RPWD) Act, across 24 States, has revealed that more than half have not notified the State rules, despite a significant lapse of time. The Act, passed in December 2016, should have been notified by all States within six months. Ten States, including Bihar, Manipur, Meghalaya, Odisha, Telengana, Tamil Nadu and West Bengal, have notified the State rules, the survey said. The study, which concentrated on the States’ administrative machinery with respect to the Act, found that nearly 80% of the States had not constituted the funds for implementation of the RPWD Act. Among the five States to have constituted the funds, Tamil Nadu has allocated Rs. 10 crore, while Himachal Pradesh has allocated Rs. 5 crore. Though 62% of the States have appointed Commissioners for Persons with Disabilities, “the progress has not been substantial. Only three States have constituted Advisory Committees, comprising of experts, to assist the State Commissioners” the study noted. While 58% of the States have not notified Special Courts in the districts for trying offences under the Act, 87% have not appointed a Special Public Prosecutors as mandated by the law, the study said. Winter is likely to be warmer than average, with fewer ‘cold wave’ days between December and February, according to a forecast by the India Meteorological Department. The forecast suggests that ‘above normal’ seasonal minimum temperatures (>0.5° C) are most likely over most of the subdivisions of the country. However Jammu & Kashmir, Himachal Pradesh, Uttarakhand, sub-Himalayan West Bengal and Sikkim, Arunachal Pradesh, Odisha and Chhattisgarh in central India, would most likely see ‘normal’ (between 0.5°C and -0.5°C) seasonal minimum temperatures prevailing. However, winter in general would be colder than last year. The Finance Ministry has issued a ‘discussion paper’ that has criticised the accounting methods used by developed countries to report how much money they have given, so far, to developing countries to address climate change. Accounting procedures, regarding the flow of climate finance, is one of the most controversial issues being debated at Katowice, Poland where countries have gathered to agree upon a ‘Rule Book’ to implement the Paris Agreement of 2015, that commits countries to ensure the earth doesn’t warm 2oC beyond pre-industrial levels. In 2016, developed countries published a road map to $100 billion, which claimed that public climate finance levels had reached $41 billion per year in 2013-14. In 2015, India had disputed this figure arguing it was only $ 2.2 billion. “The 2017 numbers also tell a similar story. Only around 12% of total pledges to climate funds have actually materialised into disbursements,” the Ministry paper notes. There was no clarity on whether the developed countries’ commitment to ‘provide funds’ meant funds committed or those that made it to their intended recipients. The total pledges to the Green Climate Fund, the largest multilateral fund, was a “meagre” $10.3 billion. Further, most of the total climate finance has flowed into mitigation (a reference to preventing carbon dioxide from being emitted). The growth in the reported climate specific finance actually slowed down from 24% between 2014 and 2015 to 14% between 2015 and 2016, the paper notes, quoting a report by the finance committee of the UN that manages climate-affairs. India and the U.S. are planning to “sort out” issues around a U.S. sanctions waiver related to India’s purchase of the S-400 Triumf missile defence system from Russia, U.S. Secretary of Defence Jim Mattis said. Defence Minister Nirmala Sitharaman is now on a visit to Washington. The Countering America’s Adversaries Through Sanctions Act (CAATSA) was signed into law by U.S. President Donald Trump in April 2017. However, the President may make an exemption to CAATSA as per the John S. McCain National Defense Authorization Act (NDAA) for FY19 — Mattis was pivotal in pushing for this part of the legislation, citing India and other countries as examples of those with historic ties to Russia now wanting to purchase U.S. defence equipment. India is expected to commission flagship 750 megawatt Mangdechhu hydropower project in Bhutan in the coming weeks, Foreign Secretary Vijay Gokhale said. The Mangdechhu project was bagged by the Bharat Heavy Electricals Ltd. (BHEL) and it will be implemented on a bilateral basis. Bhutan’s latest democratic election had firmed up its position as a leading democracy in the region, he said. The Foreign Secretary’s comments came at the end of a conference organised by the Indian Council of World Affairs (ICWA) that was organised to mark half century of diplomatic ties between Delhi and Thimphu. The French government backed down on planned fuel tax hikes in a bid to draw the heat out of fierce protests that have escalated into the deepest crisis of Emmanuel Macron’s presidency. The concessions, coming after an earlier €500-million ($570-million) relief package for poorer households, mark the first time Mr. Macron has given ground in the face of public opposition. Prime Minister Édouard Philippe announced rollbacks on fuel taxes and electricity price increases in a televised address after France was rocked by intense street clashes and vandalism in Paris over the weekend. Planned tax increases on petrol and diesel on January 1 will be suspended for six months, he said, while hikes in regulated electricity and gas prices will also be frozen during the winter. Rescinding the January increase was a core demand of the demonstrators, alongside a higher minimum wage and the return of a wealth tax on high-earners which was abolished in 2017. In a major climbdown for Theresa May and victory for Opposition parties, the British government is set to publish the full and final legal advice given to it on the withdrawal deal after a cross-party coalition of MPs won a motion finding the government in contempt of Parliament. MPs voted for a disclosure by 311 to 293 votes. The Sunday Times had quoted Cabinet sources as saying that the legal advice includes a warning that Britain could be “indefinitely” stuck in an EU customs union if the backstop arrangements to prevent a hard border in Northern Ireland kicks in. This would confirm the worst fears of opponents — including ‘hard Brexiteers’, who are adamant that Britain must be able to take back control unilaterally and from the outset. In a boost for those campaigning for Britain to either remain in the European Union (EU) or hold a second referendum, a top EU legal adviser confirmed that Britain could withdraw its notice to leave the EU unilaterally, without getting the support of other member nations. In an opinion statement to judges at the European Court of Justice (ECJ), Advocate-General Campos Sánchez-Bordona pointed to a “third way” that was now open to the K., which is facing the real prospect of a no-deal Brexit amid massive parliamentary opposition to the agreement reached between the British government and the EU-27 group of nations in November 2018. This third way involved Britain “remaining in the EU in the face of an unsatisfactory Brexit”, he wrote in the opinion. While it is a non-binding ruling, the opinion of Advocate-Generals are mostly followed by judges at the ECJ. The opinion comes ahead of a ruling in a case brought by petitioners — led by Scottish Members of the European Parliament — who had sought a ruling on Britain’s ability to extract itself from the Article 50 process, by which Britain triggered Brexit over 18 months ago. With Britain set to leave the EU on March 29, 2019, Brexit remains mired in uncertainty. Demonetisation was beneficial in terms of increasing the tax base as well as increasing direct tax collections, Central Board of Direct Taxes Chairman Sushil Chandra said. The government expects to exceed the budgeted target for direct tax collections this year, he added. “The gross rate of direct tax collections is 16.5% and net growth is 14.5%, which in itself shows that demonetisaton has really helped in widening the tax base, increasing the tax revenue, and also in deepening the tax base, which means that people who filed returns of Rs. 10 lakh about two years ago, are now reporting more now, and even the people filing returns of more than Rs. 1 crore are filing much more this year,” Mr. Chandra told reporters on the sidelines of a CII conference on tax. Chandra added that India had begun to receive information on an automatic basis from 70 countries regarding foreign assets and bank accounts held by Indians. The Ministry of Electronics and Information Technology (MeitY) has proposed that the Reserve Bank of India (RBI) come up with regulations to oversee collection, usage and sharing of data by payment service providers, even as the government is expediting discussions on the draft Personal Data Protection Bill. This follows concerns raised by the National Cyber Security Coordinator (NCSC) over collection and storage of “sensitive personal data” by payment service providers via applications such as Google Tez, WhatsApp and Paytm. During a review meeting on digital payments in October, the NCSC pointed out that there was no agreement between the National Payments Corporation of India (NPCI), the banks and the applications that provided payment services. The NCSC recommended that there was a need to scrutinise all aspects of a relation – legal, technical and financial, between all the stakeholders in the payments ecosystem. In April, 2018, the RBI directed all payments service providers to ensure that the data relating to payment systems operated by them were stored only in India. This came into effect in October 2018. A committee appointed by the Securities and Exchange Board of India (SEBI) has recommended allowing unlisted Indian companies to directly list their shares on overseas exchanges in at least 10 countries. While this is a major shift from the current regulatory regime that does not allow unlisted Indian companies to have a direct overseas equity listing, it would require changes in regulations that are outside the purview of the capital market watchdog. While the committee has put forth its set of recommendations, such listing would only be possible after changes in two key laws — FEMA and Companies Act. The report added that such listing can benefit companies in the form of alternate source of capital, broader investor base, better valuation along with other strategic benefits. The committee has asked SEBI to request the Reserve Bank of India (RBI) and the Ministry of Corporate Affairs (MCA) to amend the laws that fall under their respective jurisdiction. The capital markets regulator has sought public feedback on the recommendations till December 24. The number of patents granted by India shot up by 50% in 2017, keeping up a trend of steep increases, according to the UN’s World Intellectual Property Organisation (WIPO). The patents granted by India increased from 8,248 in 2016 to 12,387 in 2017, the WIPO’s World Intellectual Property Indicators 2018 report released in Geneva said. 2017 number was more than double the 6,022 patents granted in 2015, according to WIPO statistics. Of the patents granted in 2017, 1,712 went to entities and individuals based in India, and 10,675 to foreigners, according to the WIPO report. The WIPO said that the steep increase in the number was driven by patents granted to foreigners, which accounted for 85% of the total increase. Globally, 1.4 million patents were granted in 2017. 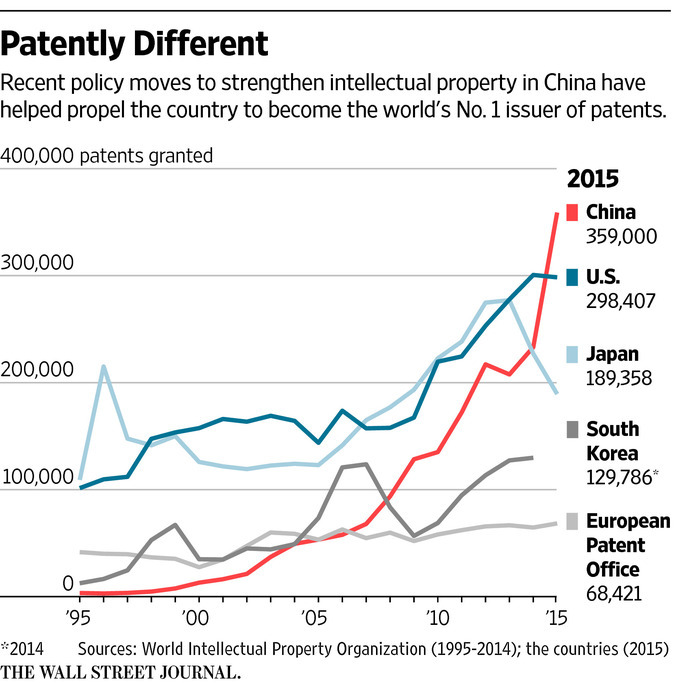 China led the world with 4,20,144 granted patents and was followed by the U.S. with 3,18,829.